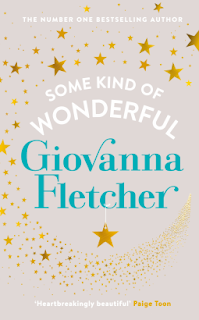 It's no secret that I absolutely love Giovanna Fletcher. I love her vlogs, her articles and of course her writing. I have devoured each of her novels in days and adored them all equally. So, when I found out she was releasing a new novel - Some Kind of Wonderful, I knew I had to read it. When I was sent an E-ARC of it from the guys at Michael Joseph I was ecstatic and couldn't wait to read it. Lizzy and Ian have been a couple since their first day at university. After a decade together, everyone thinks they are about to get engaged. A romantic break to Dubai seems to be the perfect chance. However, instead of a proposal Lizzie gets dumped by the guy she thought she would be spending forever with. Although heartbroken, Lizzy realises this is the chance to seize opportunities she missed whilst being with Ian. Determined to discover the real Lizzy she sets out on a voyage of self discovery, having fun in the process. Like Gi's other novels this is a quick easy read. The plot is easy to piece together and the pacing quite comfortable. It is your typical chick lit read to be quite honest with you and there's nothing wrong with that. It's perfectly okay to indulge in it once in a while, right? The story itself could be seen as relatable to some. Although we may not all have been heartbroken in the way Lizzy was, we have all probably at some point looked at our lives and thought 'is this really who I am?'. However, there are parts (won't go into detail because of spoilers) that probably wouldn't happen to any of us in real life. Alas, that is the joy of fiction. You can put characters in situations that probably wouldn't happen to you. When reading Some Kind of Wonderful as well as finding it somewhat relatable, I also found it to be quite realistic. The story wasn't about Lizzy going on a big adventure to find herself again. It was about her recovering at home, being supported by an amazing group of family and friends and finding a new path for herself. This is just like what any of us would do after a big life changing event surely? Lizzy herself was a character that I found really hard to warm up to. At the start I found her to be very obsessive when it came to getting engaged and it wasn't the best first impression of a main protagonist. This caused her to not have much depth as a character. However, as the story progressed I found myself slowly liking her. She became a lot more fully rounded as a character and it was a joy to see her develop. Lizzy was surrounded by an array of lovely supporting characters. I loved Connie! She was the best friend I never had! She brought light and life to the story and had me smiling at every scene she was in. I'd love a book all about Connie! Lizzy's family were also great in their roles. I loved the dynamic between her mum, dad and stepdad Ted. Also her sister Michelle..well lets just say there was one scene where I couldn't stop the laughter from coming. Despite all these positives there were a few negatives I needed to pick up on. Although I love her writing, I feel that Giovanna uses dialogue a lot to move the plot forward and it can become a bit tedious at times. Some parts of the dialogue weren't really needed and could have been worded in proper prose. I won't let this deter though from the fact that the story overall was very well rounded. Some Kind of Wonderful was a quick, easy, cute little read about one woman discovering who she really is. Gi's novels always have you coming away with a smile on your face and a warm feeling in your heart. Oh and before I go.. did anyone else notice the Billy Buskin reference? Was such a neat little touch don't you think?